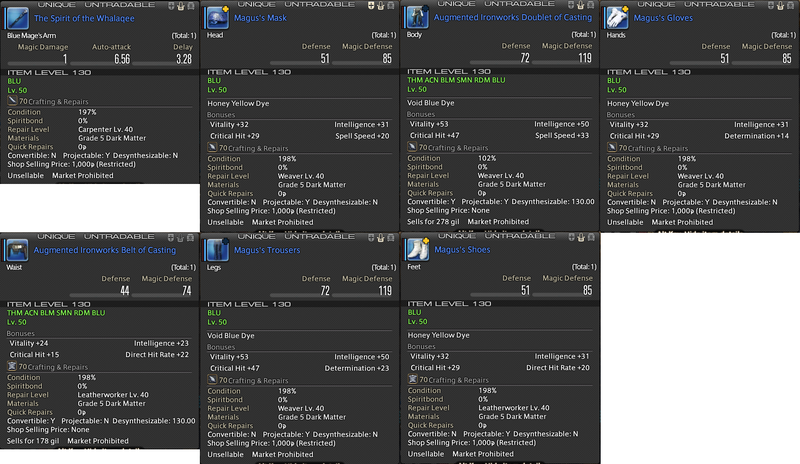 Blue Mage	Caimie	Guide	Leveling	Endgame	Best-in-Slot	BiS	pentameld	overmeld	gear. 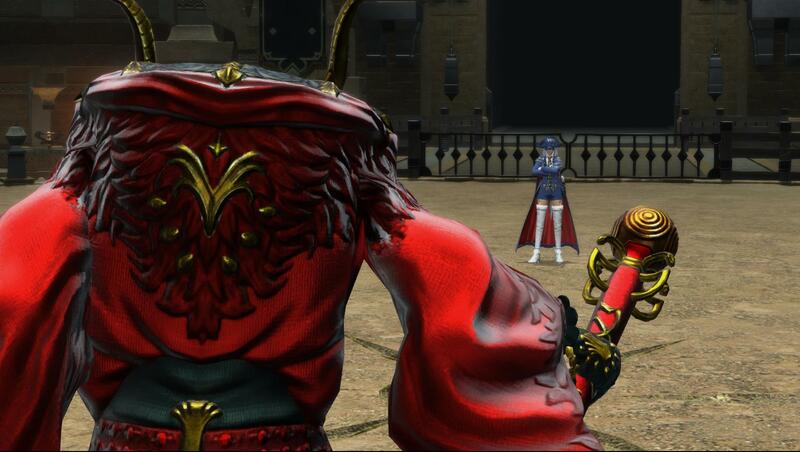 In Patch 4.5, by popular demand, Blue Mage (BLU) has been added to FFXIV Stormblood. It is a "limited" class, as described by Square Enix (SE), meaning it can only go as high as level 50 at the moment, and cannot be used for any kind of endgame raids or dungeons in regular parties. It cannot be used for any main story quests either. 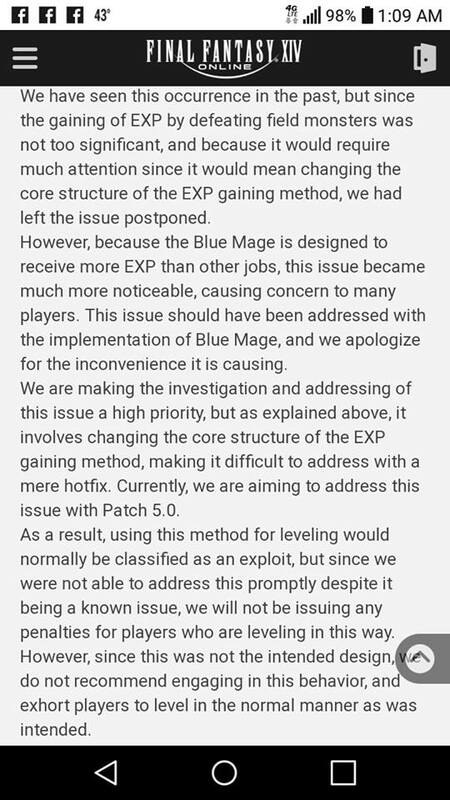 Prior to Patch 4.5, the decision of adding a "limited" Blue Mage into the game has spiked a great variety of opinions. Some complained that this is pointless as the limited class cannot be used for raids (They said, "If this class cannot be used for endgame contents, then it's just a mini-game"! Apparently, they are not interested in mini-games, and believe SE 'wasted' the class). By contrast, some are happy that at least the class made it to the game, and they trust that SE will still make it heaps of fun. The reason why BLU is a limited class in FFXIV is because traditionally, BLU's nature is to learn skills from monsters (by seeing it, experiencing it, getting hit by it or consuming your enemy etc.) and then use those skills back against its enemies. This nature makes BLU not fitting into the "tank, healer, DPS" holy trinity setting of FFXIV. For instance, some skills from monsters may be way too overpowering. Well, how about nerfing them? If these skills are all nerfed, then they are not fun to play any more. Also, if BLU is to learn its skills from different enemies, then players with more skills will be favored by parties over players with fewer skills, which may create problems in the community, as some BLU may not be welcomed into parties. By contrast, if you let all BLU be equal and start with a set of pre-determined skills, then suddenly BLU isn't BLU anymore. This is the dilemma that SE faced when people were demanding BLU to be added into FFXIV. In the end, SE created this "limited" class. So far, I gotta say, I've been having a ton of fun playing it! As you can see above, they are not going to ban anyone using this "glitch" to quickly level. Honestly, it is not a game-breaking glitch. It just makes you reach level 50 a lot faster. But the "real grind" for BLU is about acquiring needed skills/actions for participating the "Masked Carnivale". That is the real endgame for BLU at the moment in Patch 4.5, and it's a lot of work to get there. Currently, they have no immediately plans to fix these glitches until 5.0. So I would actually encourage you to take this opportunity to easily level up your BLU right now. 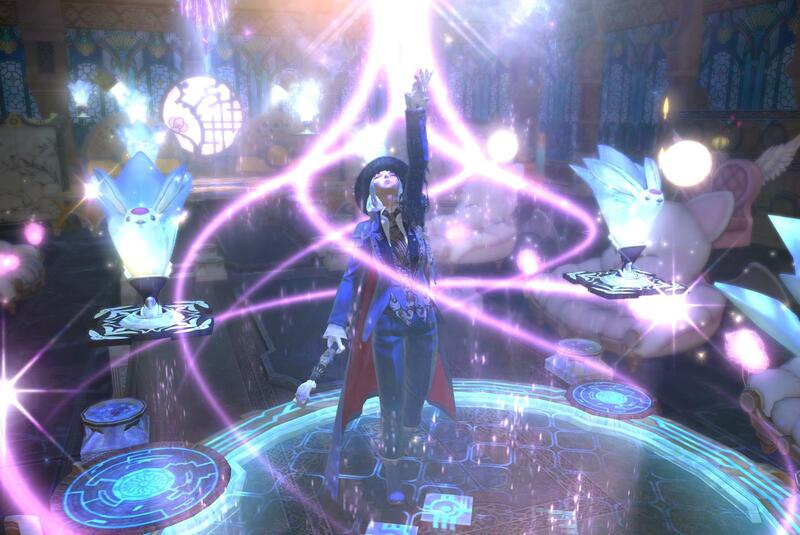 Quick Leveling Method #1 (playing solo): You need to have a very high level caster, such as red mage (RDM), (black mage) BLM or white mage (WHM). Ideally level 70. 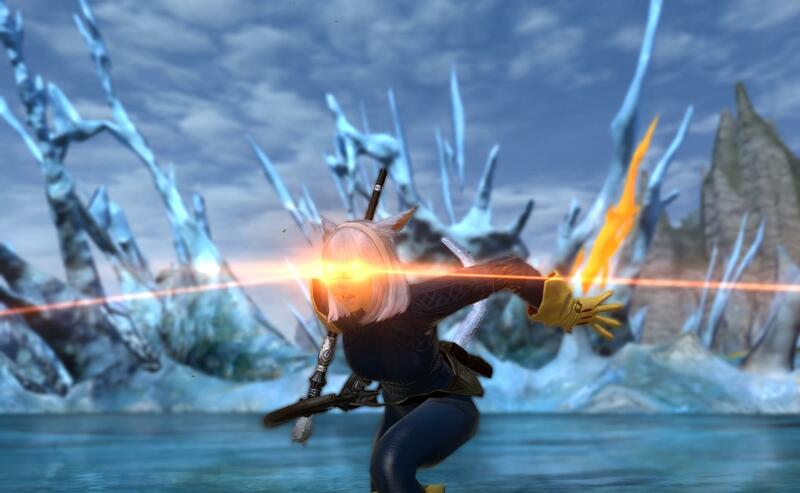 For example, if you're using a level 70 RDM, use it to cast "Jolt" on a single target enemy. You must one-shot the enemy, and you must not aggro anything else. When the target dies, quickly switch to BLU, and the gained EXP will fall under BLU now. After the enemy dies, there's approximately 1 second delay before EXP is granted. Switching to BLU takes about 0.5 second. So you should be able to do this, as long as you have the gear-changing button set up on your hotbar. The target enemy CANNOT be level 50 or above. It has to be level 49 or below. Thus, the best enemies would be those in Northern Thanalan because they're level 49. Ideally, you want to chain your kills. So that you gain the bonus EXP from your chain. For this reason, it's better to stand near a big group of tightly packed, yet individual enemies. One such location is the "Abandoned Amajina Mythril Mine". But the mine not the only place that can be utilized... even the nearby areas have plenty of level 49 mobs. Personally, I used this method to level my BLU. It took me about 3 to 4 hours to get from level 10 to level 50. 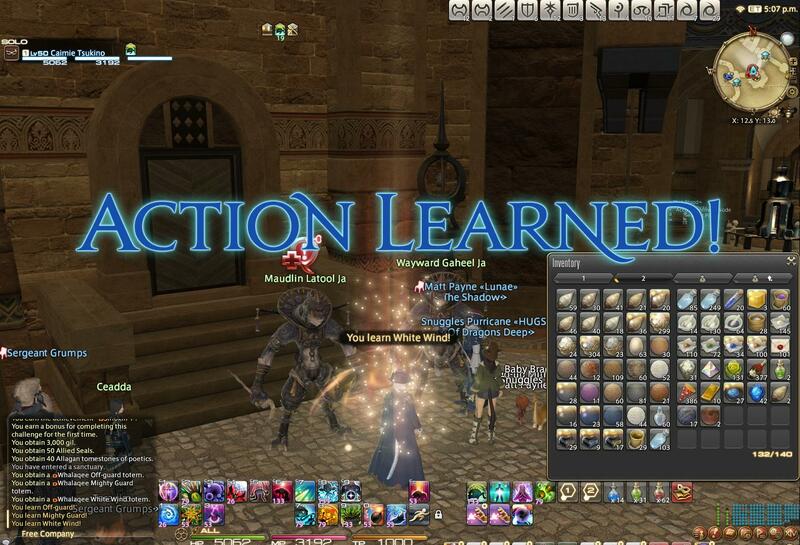 Quick Leveling Method #2 (with a partner): You need a partner who plays level 70 Scholar (SCH) or Astrologian (AST). DO NOT party up. First, have your friend shield you with Adloqium or Aspected Benefic under Nocturnal Sect. This way you won't get one-shotted by the enemy. Then you go aggro a single enemy target (enemy details same as described above in Method 1) by hitting it with any spell. 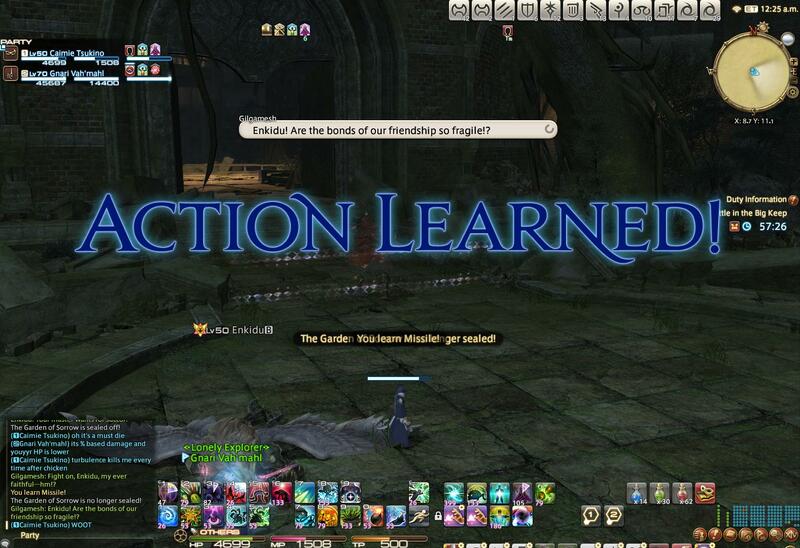 Then have your SCH/AST friend one-shot the enemy while aggro was on you. You will then gain the EXP. Ideally, you want to use "Flying Sardine" as your choice of attack because it has zero cast time and has a superb 25 yalm range. If you just use your regular "Water Cannon" (2 sec cast time), it will take you a very long time to level up, and will be difficult to chain anything. - Your Blue Magic Spellbook is located under the "Character" tab. - Drag it onto your hotbar (red arrow), so that you can easily access it. 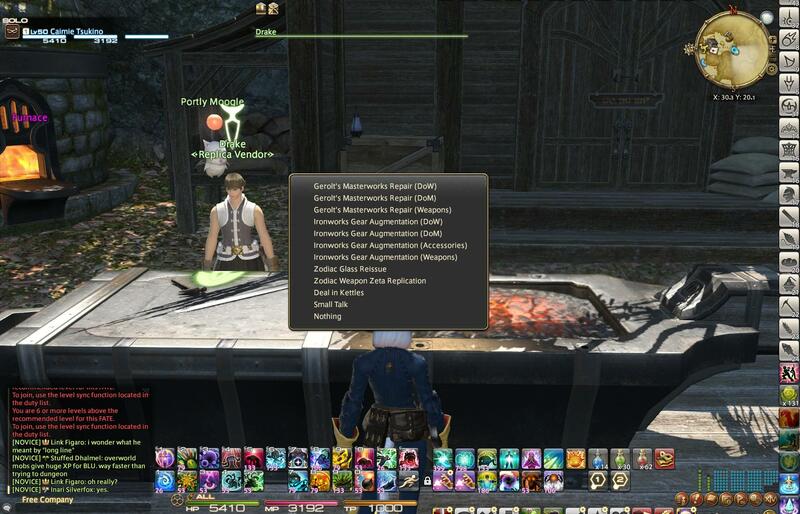 It also helps a lot to have your Red Mage and Blue Mage gear sets buttons on your hotbar (green arrows), so that you can easily switch between the two when you're leveling. 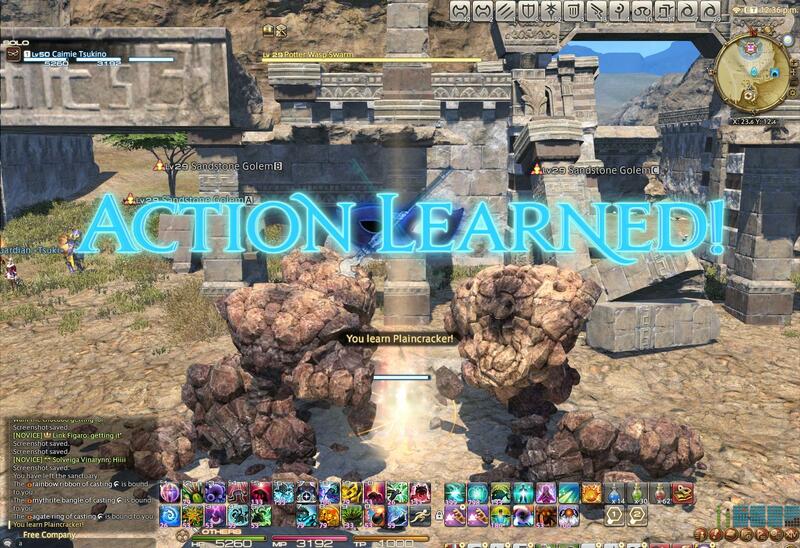 - The most favored location for leveling Blue Mage is here... at the "Abandoned Amajina Mythril Mine" Northern Thanalan (25,23). This place has a lot of tightly packed level 49 mobs. You can chain them up easily. 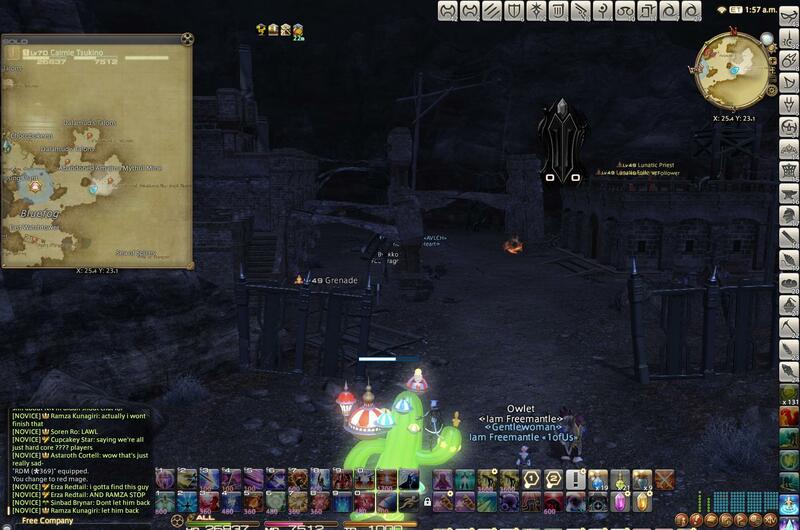 For the 3 mobs shown at the top right of this picture, you can even use RDM's "Contre Sixte" to kill them all together in a single blow, and then switch to BLU to earn all the EXP. Where do I unlock BLU? 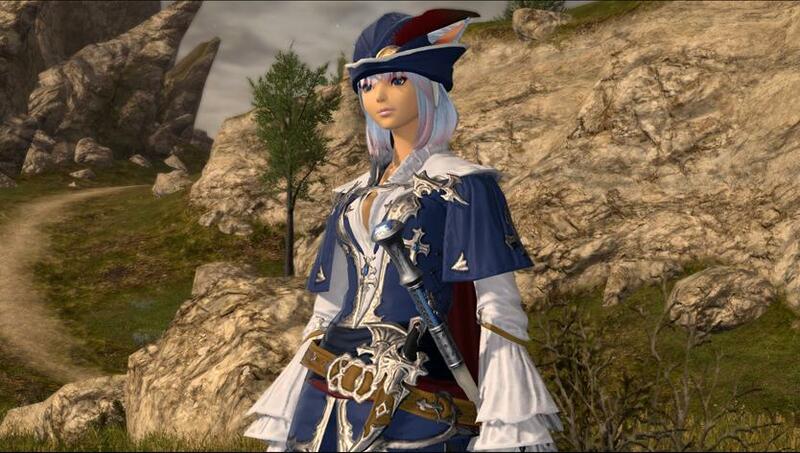 BLU unlock quest location: Limsa Lominsa. The quest is called "Out of the Blue". What is the primary attribute of BLU? Should I use FATEs to level up? No one says you can't, but it really is not a good way to do it. Let's say you're level 8. Each level 8 FATE will only give you approximately 2000 EXP. But each level 10 mob in the open world will already give you like 400 EXP (whereas the mobs in the level 8 FATE will give you barely like 50 EXP). Thus, doing FATEs is really a waste of time without achieving very much. Should I bring my chocobo? If you're facing enemies in the wild by yourself, your chocobo will be very important. E.g. if you're level 8 and you're tackling a level 10 monster in the open world, chocobo will do wonders. However, if you're using the "glitch" method 1 or method 2, then chocobo is not needed. In fact, it just gets in the way. So is BLU only for solo play? The simple answer is NO. At the beginning, I thought BLU was for solo play. But now I found that you actually need help from a lot of other people in order to acquire skills from dungeons, trials etc. in order to even complete your class quest. So, NO, BLU is not for solo play. You need to play with other people and get help from them. (1) Leveling to 50. I personally recommend quickly leveling to level 50 first before starting to acquire any skills. This way you won't be bullied by any monster around the world. If you're using the Quick Leveling Method #1 (solo), you won't even need to update your gear while leveling. You can be as naked as you want, because all you do is killing mobs with another class, and then switch to BLU to receive the EXP. (2) Gear up briefly. 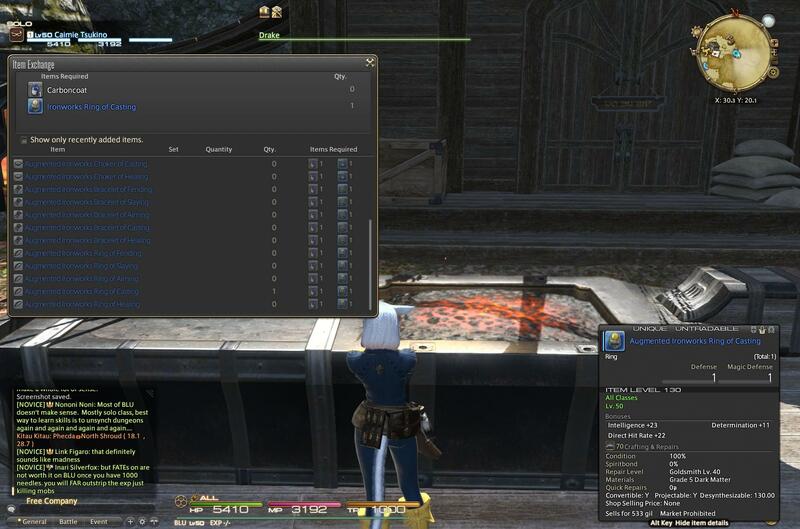 Purchase i120 Ironworks gear using Poetics tomes at Mordhona, or acquire the crafted i115 Rainbow Casting Set (https://ffxiv.gamerescape.com/wiki/Rainbow_Casting_Set). This will give you a nice boost in power and survivability. You may upgrade some gear to i130, but that is only if you have extra Poetics tomes. Since your Level 50 Class Quest will get a full set of i130 left gear that includes weapon, hat, chest, gloves, pants and shoes, it is better to focus on the pieces that you don't have, which includes the belt, earrings, choker, bracelets and the two rings (Note: You can't have 2 identical unique Ironworks rings.). Alternatively, crafted HQ gear (i115) is also fine. At this point, you don't actually need the best gear yet. You just want to fill every slot with an item that is above i110. - After purchasing i120 Ironworks gear / accessories from Mor Dhona, you can upgrade them to Augmented Ironworks (i130) at Drake in North Shroud (30,20). - The upgrade requires a Carbontwine or Carboncoat (also bought from Mor Dhona). - 1000 Needles: This is one of the best skills to have early, as it deals a fixed 1000 damage (shared by all enemies). Its drawback is its long cast time. But if you pair it up with Swiftcast, then you'll be fine. This is a skill required for your Level 40 Class Quest anyway. - Blood Drain: This is useful on the sense that it is a weak attack that can be used to aggro stuff without killing them. - Bomb Toss: A decent skill that can be easily learned. It is an AoE that stuns the enemies. So it helps with the early game. - Self Destruct: This is useful as a mean to perform "Free Teleport Home". Treat this as your "Return" button, but with no cooldown. - Toad Oil: Do not underestimate this. A nice 20% evasion is almost equivalent to having a 20% damage reduction. It's actually significant. - Bad Breath: It's... just... fun... to give your enemies a really bad day. - Flying Sardine: A super long range attack that does almost no damage and very little aggro. It's just useful for pulling things from afar. - Faze: This AoE doesn't do any damage, but stuns your enemies for 6 sec, which is quite nice for early game. This is a skill required for your Level 30 Class Quest anyway. Remember, since you're level 50 now, you may one-shot some low level enemies using Water Cannon. So in order to learn skills from them, you need to keep them alive by using very weak attacks on them. Aggro a bunch of them mobs, and then let them gang on you for a bit. Wait for each of them to use the skill that you want to learn. After a little while, just use AoE on them, and finish them all together. The role skill "Addle" is something that you can use to aggro them, but it has a very long re-cast time. Another skill would be "Blood Drain" (20 potency). If available, "Break" can also be used since it has only 50 potency. Once you have Flying Sardine, it is a even better choice, as it has only 10 potency and a wonderful 25 yalm range. - Mind Blast: Possible one of the best skills for a fresh level 50 BLU. Although it has only 100 potency, it is an AoE skill that has only 1 sec cast time. That is incredibly fast! You're basically doing about 100 potency damage per second. Most other skills give only between 120 to 150 potency but has a 2 sec cast time. Thus Mind Blast actually trumps them all on damage per second. Not to mention it leaves a nasty 30 sec paralysis status on enemies, which sometimes stops their casts. This skill is also required for your Level 20 Class Quest. So you will need it anyway. Since the hotfix on 23rd Jan 2019, the drop rate has been increased to 100%. So you just need to run Tam Tara once. (5) Acquire White Wind and Mighty Guard from NPC. Once you have learned 10 spells, speak to the NPC Wayward Gaheel Ja (Steps of Thal 12,13), and learn "White Wind". This is your primary healing spell, and you will need it asap. If you would like to do your class quests now, feel free. But you will need "Glower" to do your Level 50 Class Quest. And to get Glower, it's better to first get White Wind so that you can heal yourself in Aurum Vale. Similarly, you should acquire Mighty Guard (required learning 10+ spells) and Off-guard (required learning 5+ spells) from Wayward Gaheel Ja. Mighty Guard can reduce incoming damage by an amazing 70%, but it sacrifices 40% of your damage output. It also increases your enmity. So don't always pop this. Use it only when you need it. Off-guard acts like a debuff for a target, and basically makes your magical attacks more powerful on the target. - White Wind and Mighty Guard can be unlocked when you have unlocked 10+ spells in your spell book. - Glower: This is a relatively strong skill (130 potency) that paralyzes your targets for 6 sec. You learn it from the 2nd ogre boss in Aurum Vale. It is also a required skill for your Level 50 Class Quest. However, you will need a level 70 partner to run through Aurum Vale quickly for you. I have tried this before with just 2 Blue mages, but it was very, very tough to do Aurum Vale. Since the hotfix on 23rd Jan 2019, the drop rate has been increased to 100%. So you just need to run Aurum Vale once. - Ram's Voice and Dragon's Voice: These are actually very nice skills to have, especially Dragon's Voice, which allows you to practically hide behind obstacles from afar, and hit your target(s). 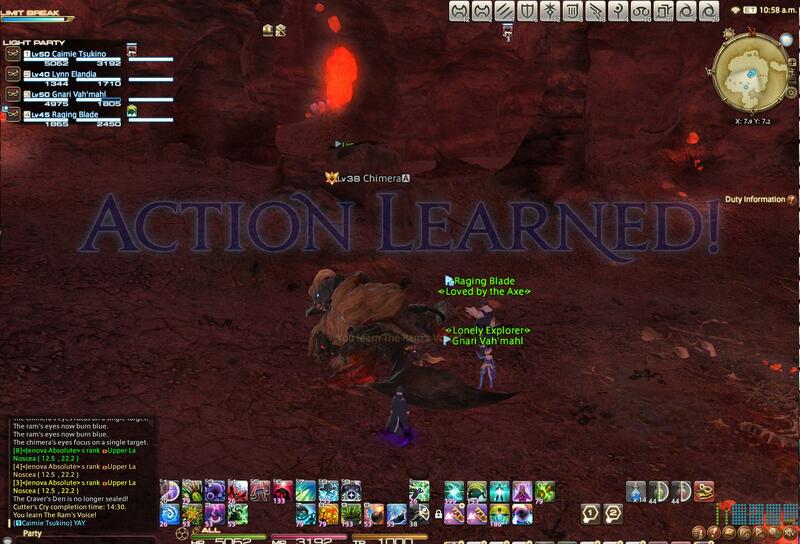 These skills can be acquired from the Chimera trial fight from A Realm Reborn. Alternatively, they can be acquired from Cutter's Cry's final Chimera boss. If you're doing this way, you will need to run the dungeons a few times. We found that having 4 Blue Mages is actually sufficient to effectively farm it from Cutter's Cry. So you don't necessarily need a level 70 here. The Chimera trial fight would be easier though since you don't have to get through a whole dungeon to fight the Chimera. - Diamondback: This is quite a powerful skill that reduces damage by 90% while immobilizes you for 10 seconds. This is very useful when you are doing the Masked Carnivale. - Missile: This is a hit or miss skill that is actually very overpowering when it lands. I love using it on any dungeon bosses. Sure, it misses a lot. But when it hits, it immediately halves the HP of the target. It's pretty amazing. - Missile, acquired from Enkidu in the Battle in the Big Keep. - Tail Screw: Similar to Missile, although having a high missing rate, this is also another overpowering skill that does wonders when it actually lands because it reduces the enemy's HP to 1. 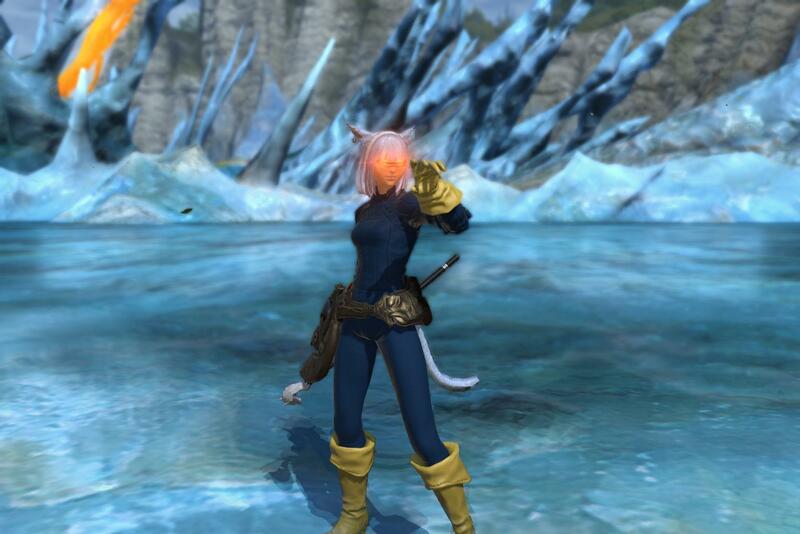 - The Look / Level 5 Petrify: The Look is basically Optic Blast of Cyclops from X-men! And if The Look is like heat vision, then Level 5 Petrify is like cold vision! These skills are not very practical in battle, but they're just so much fun to have! - Yep, I love my Cyclops cosplay using "The Look" as Optic Blast! It's just awesomeee! (7) Do your class quests to obtain your i130 set. Once you have acquired Glower, you can easily finish your Level 50 Class Quest. This will unlock the "Masked Carnivale" for you, and you will also obtain a set of i130 gear (hat, chest, gloves, pants and shoes only). 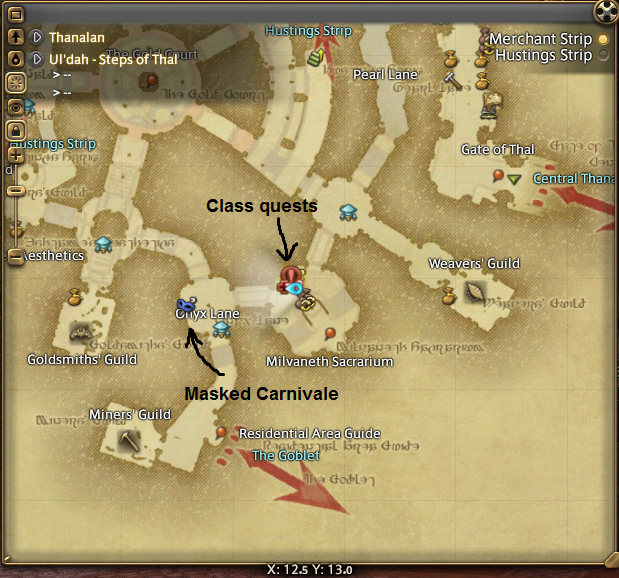 - Locations of Blue Mage Class Quests and the Masked Carnivale. - Level 50 class quest before unlocked the Masked Carnivale. (8) Gear up with the BiS (Best-in-Slot), and get ready for endgame! The endgame for Blue mage is basically farming the super rare 5 star skills from Extreme Primals, as well as to do the Masked Carnivale. As mentioned earlier, completion of the Level 50 Class Quest would grant you the i130 Magus Set (weapon, hat, chest, gloves, pants, shoes). However, the Augmented Ironworks Set is also i130. So which one is better? 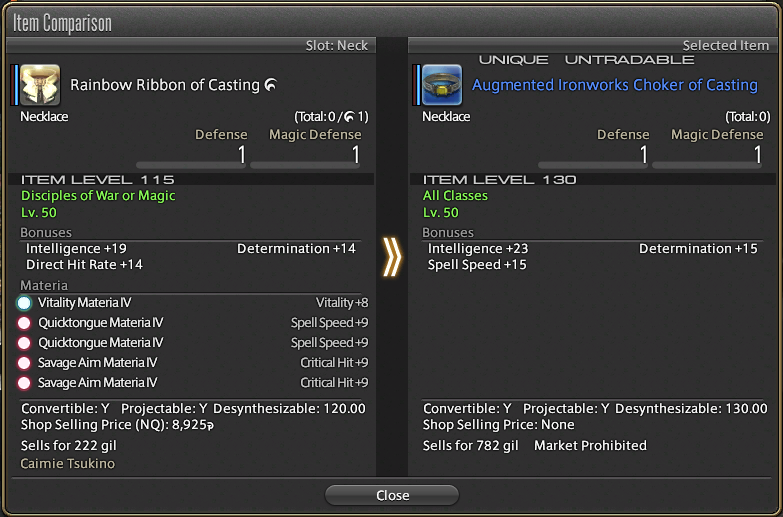 Well, I personally favor Spell Speed and Crit for my Blue Mage, so I chose the i130 Augmented Ironworks chest piece (see below) to substitute the Magus chest. As for accessories, since you cannot obtain any from class quests, it's only natural that the Augmented Ironworks is the best in primary stats (Intelligence). However, pentamelded HQ crafted gear (i115) may act as a very good supplement, as you can meld Vitality there to increase your chance of survival. Also, it allows you to tweak towards your desired secondary stats. I have chosen to use crafted gear for the choker, bracelet and 1 ring to create a build of higher Vitality, Spell Speed and Crit (see below). NOTE: I do not recommend overuse of pentamelded crafted gear, as it will lower your Intelligence too much, and hurts your DPS in general. You have to strike a balance between Intelligence vs Vitality + Better Secondary Stats. 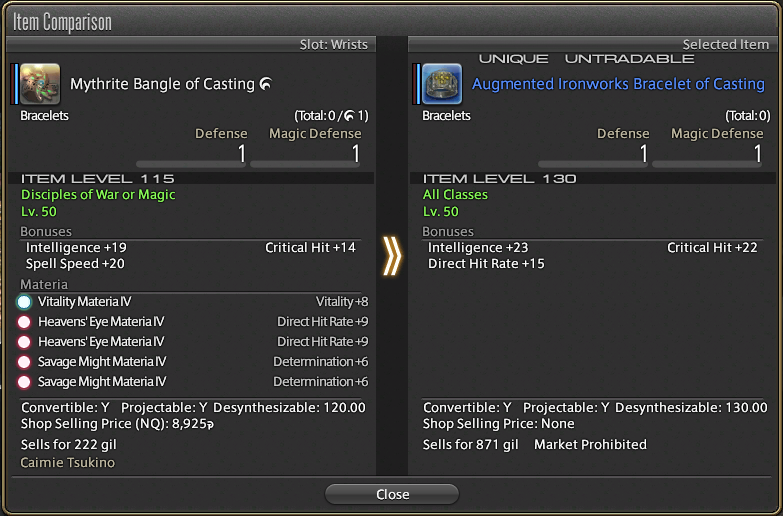 - A comparison of a pentamelded HQ crafted choker vs the Augmented Ironworks. Although the crafted one has 4 less Intelligence, it has 8 more Vitality. And although it has 1 less Determination, it has 3 more Spell Speed, 18 more Crit, and 14 more Direct Hit. 8 more Vitality translates to 116 extra HP (each Vit = 14.5 HP). - A comparison of pentamelded HQ crafted bracelet vs the Augmented Ironworks Bracelet. The Mythrite Bangle of Casting has 4 less Intelligence, but 8 more Vitality. It has 8 less Crit, but 3 more Direct Hit, 20 more Spell Speed and 12 more Determination. 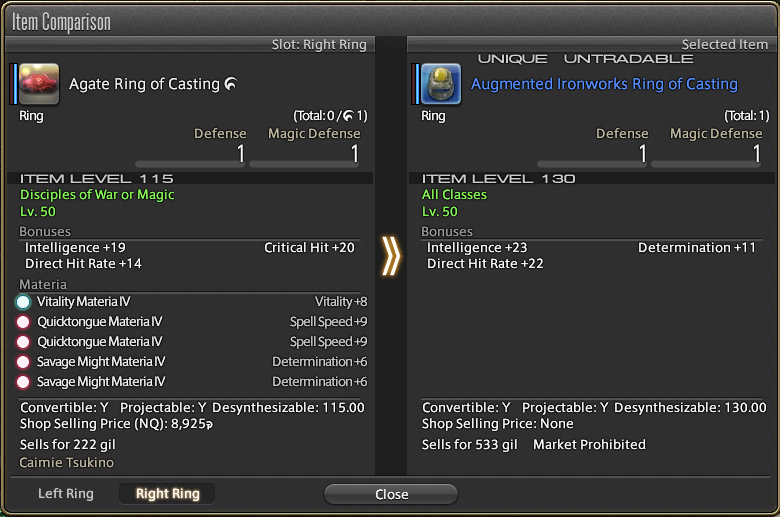 - A comparison of the pentamelded HQ crafted ring vs the Augmented Ironworks Ring. The crafted one has 4 less Intelligence but 8 more Vitality. It has 8 less Direct Hit, but 18 more Spell Speed, 20 more Crit and 1 more Determination. - After using 3 pieces of crafted gear, my HP increased by 348, making me much durable. This was achieved by sacrificing 12 Intelligence, but I also have much higher Spell Speed and Crit. - Delivers water damage with a potency of 120. - Deals fire damage with a potency of 110 to all nearby enemies at a designated location. - Deals unaspected damage with a potency of 20. 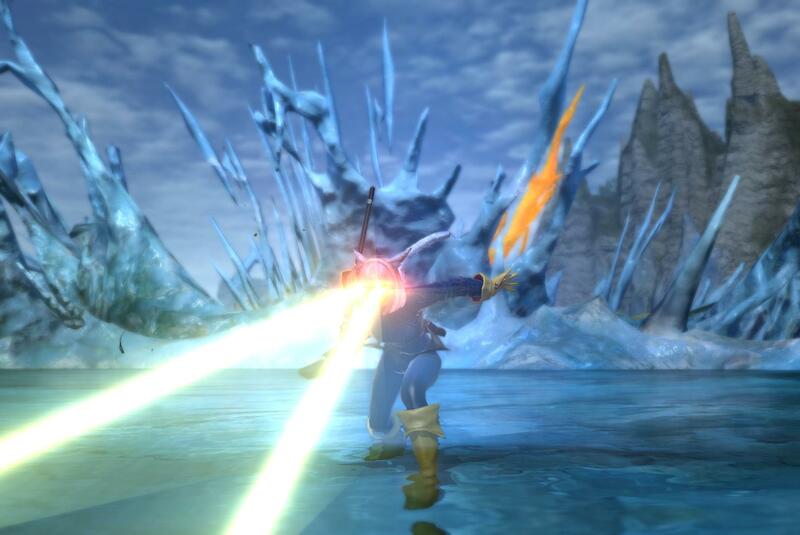 - Counters enemies with ice damage every time you suffer physical damage. - Deals fire damage with a potency of 900 to all nearby enemies while incapacitating self. - Increases damage you deal target by 50%. Recast timer is reset if target is KO’d in battle before the effect expires. NOTE: When a single target is hit by multiple Off-guards from several Blue Mages, you will see multiple Off-guard icons on the target, but their effect don't actually stack. Each Off-guard will only affect the Blue Mage which it came from. - Deals unaspected damage with a potency of 1,500 while incapacitating self. - Deals unaspected damage with a potency of 100 to all nearby enemies. NOTE: Your basic spammable AoE with a decent potency considering its short 1 sec cast time. Its 30 sec paralysis is also very powerful. - Puts target and all nearby enemies to sleep. Cancels auto-attack upon execution. - Increases the potency of the next spell cast by 50%. NOTE: Very useful skill! Wonderful to be used in certain stages of the Masked Carnivale, allowing you to buff up actions like Self-Destruct. Can be used together with Off-guard and Moon Flute to further buff an attack. NOTE: This skill is very useful in some stages of the Masked Carnivale, as it provides you with a mean to maneuver targets around the arena. NOTE: Essential skill for almost anything. NOTE: Please don't turn this on in dungeons if you're running with some level 70 DPS classes, as this skill will generate a lot of aggro, and make enemies attack you instead of your level 70 friend. Use it only when needed to avoid damage, or unless you're really trying to be the tank. This skill TRUMPS Diamond Back on the sense that you're still free to move under its effect. So it has its place in the Masked Carnivale when you're trying to stay alive against certain attacks. NOTE: Keep in mind to make sure this skill is active before using Self-Destruct in the Masked Carnivale. It increases the potency of Self-Destruct from 900 to 1200, which is a lot. Important point: He will do petrification there in the final boss's room as an add. So learn from him in the final boss fight (don't kill him too fast there, make sure you "see" the skill). When he dies in there, you will have a chance to get it (pray to your RNG goddess). If you don't get it when he dies, don't bother killing the last boss! You can reset the fight by killing yourself. This way, you can re-enter the room and face him again without redo-ing the whole dungeon. NOTE: This skill is ESSENTIAL in some stages of the Masked Carnivale. This is your basic "silence" skill to stop certain deadly spells being casted by enemies. NOTE: This turns out to be a very useful skill in the Masked Carnivale, as it "Deep Freezes" many types of enemies, stopping them from casting certain deadly spells, or significantly reducing incoming damage from them. NOTE: This skill is quite fun to play with, and somewhat useful in many situations. It provides you with a mean to hit multiple enemies around you, or behind walls. If the target(s) was hit by Ram's Voice before and was in Deep Freeze status, it becomes significantly stronger. NOTE: Apart from this being required in your class quest, this is also one of the most-used skill in the Masked Carnivale. It provides you with a basic spammable ranged attack that damages multiple targets, and is slightly stronger than your Water Cannon. NOTE: This skill is actually considered wind attack in the Masked Carnivale even though it does zero damage. NOTE: You can also learn it from Leviathan (Whorleater). NOTE: You can also easily learn it from the golems at the south (not the southwest ones) of the North Shroud aetheryte, or the golems outside Qarn temple entrance at South Thanalan. - I Learned Plaincracker outside the Qarns temple near Little Ala Mhigo at Southern Thanalan. NOTE: This is quite essential for the completion of a number of stages in the Masked Carnivale. It provides you with a spammable ranged physical attack that hits multiple targets. NOTE: you can also learn this from the "Necro" battle leves in Mor Dhona - The Liminal Ones. NOTE: This skill is quite essential for some stages of the Masked Carnivale as it is the only single target spammable physical attack. 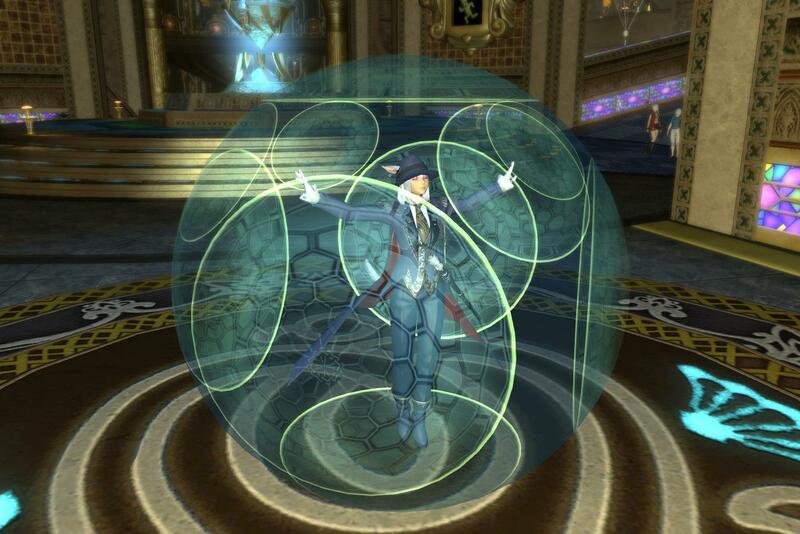 When two targets are present, and one is vulnerable to only physical attacks (and the other reflects physical attacks), then this skill can be used instead of Drill Cannons. - Move quickly to the specified location. Cannot use when bound. NOTE: This skill is REQUIRED for the completion of certain stages of the Masked Carnivale. 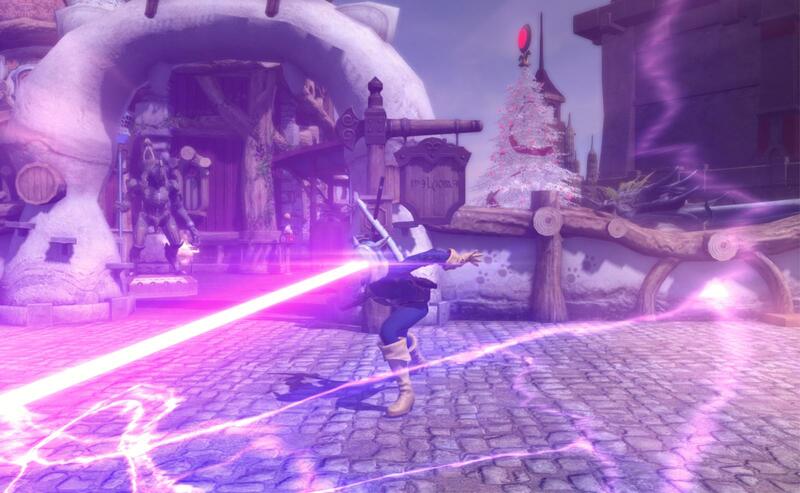 It allows you to move freely even when a very severe slow debuff is applied onto you. NOTE: This is quite useful in the Masked Carnivale as one of the stages comes with some pretty strong targets that are vulnerable to fire damage. NOTE: Enkidu uses it during Phase 1 of the trial. If you don't get it by the time Enkidu dies. Just leave and redo Phase 1 of the trial. NOTE: You can also learn it from the monster "Crag Claw" in the open world (The Peak 23,11). But since it's a level 61 Monster, you will need a level 70 partner in your party to help. NOTE: You can also learn from the turtle add (Horde Armor Dragon) in "The Steps of Faith" too. This is actually a much better choice. Go with a level 70 who can solo everything. This skill is quite essential for some stages in the Masked Carnivale. NOTE: This skill is considered a PHYSICAL attack. This can be used against targets that reflects magical attacks.